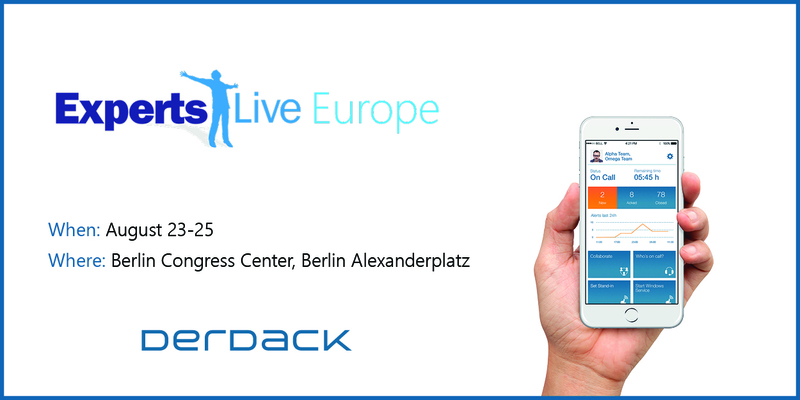 Derdack | Meet our experts @ Experts Live Europe in Berlin! Formerly known as System Center Universe, Experts Live Europe is one of Europe’s largest community conferences with a focus on Microsoft cloud, datacenter and workplace management. Being a long-term Microsoft Partner Derdack gladly announces its contribution as Bronze Sponsor for Experts Live Europe this year. Throughout the 3-day event you can meet our experts live on-site! They are happy to proviode you with any information about Derdack’s product portfolio providing targeted alert notifications & anywhere incident remediation. These evidentially lead to a 10x faster incident response and resolution. Join us to learn more!